Prince William, paid respects to the six million Jews murdered in the Holocaust during a somber visit to Yad Vashem, the World Holocaust Remembrance Center, in Jerusalem on Tuesday. “Terrifying. [I’m] trying to comprehend the scale,” he said as he viewed a powerful display of the victims’ shoes, Haaretz reported. 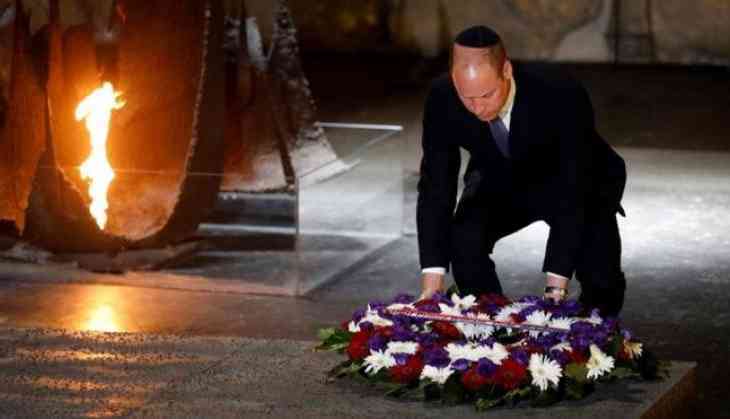 He wore a traditional kippah on his head to show his respect as he laid a wreath in the Hall of Remembrance. He spent an hour and a half touring Yad Vashem, the first stop in his historic tour of Israel and the disputed territories. It is the first official visit to Israel by a senior member of the British royal family. Inside the center’s Hall of Names, which honors those whose resting place is unknown, he read some of the personal details of the millions who perished. Their names have been recorded on Pages of Testimony, which serves as tombstones. He then headed to spend time with Israeli Prime Minister Benjamin Netanyahu and his wife Sara before meeting Israel’s President, Reuven Rivlin, at his residence. William’s grandfather, Prince Philip, traveled to Israel in 1994 for a Yad Vashem ceremony honoring his mother, Princess Alice of Battenberg, who saved Jews during the Holocaust by opening the doors of her palace in Greece.